LG which is doing good in the high end smartphone market with its flagship device the LG G3 which is a successor to the LG G2 and now they are trying to capture the mid range market and the largedisplay lovers by releasing a 5.5 inch variant of LG G3 which comes equipped with a Stylus. 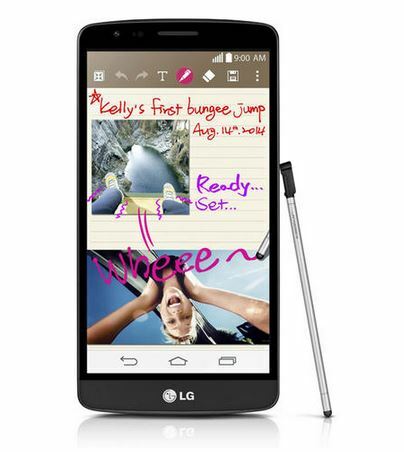 The device is named as the LG G3 Stylus which has the following features and specifications at offer. It comes with a 5.5 inch qHD display which has 960 x 540 pixels resolution and runs on 1.3 GHz quad core processor which has 1GB of RAM. The camera is a 13 MP primary or rear camera and the front camera is a 1.3 MP camera. The device comes with 8GB of internal storage which can be expanded using a microSD Card. The device runs on Android Kitkat 4.4.2 Operating system and the device is powered by a 3000 mAh battery which is pretty good compared to the devices with similar screen size and at this price range. Coming to the design aspect of the LG G3 Stylus device has a Floating Arc design which has gradually tapered edges. The device also has a metallic skin back cover which is similar to the one present in LG G3, the bezels are similar to the LG G3 with thin bezles and the front of the device being covered mostly by the Display making it look even more appealing to the eye with the 5.5 inch display. Coming to the stylus which is being offered with the device is a Rubberdium stylus pen which is quite easy to hold and use with the device. With such great features at offer the device is going to give good competition to devices int eh 5 inch and above category with decent pricing. The price of the device is Rs. 21,500 which is very competitive with the features which are being offered. It will come in competition with devices like Desire 816, Micromax canvas doodle 2 and Xperia T2 Ultra.